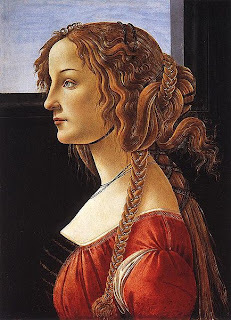 Today, on 1476, dead Simonetta Vespucci, the most beatiful woman of The Renaissance, the one who inspired Botticelli for his great painting as La nascita di Venere (The Birth of Venus), La Primavera (The Spring) and all the greatest painters, writers and politicians of that period, Lorenzo The Magnificent and her brother Giuliano e.g. On this day Lorenzo il Magnifico, Lorenzo the Magnificent will wrote: " Oh brith star..." imaging her as the brithest star in the sky after her death. But for a star getting down a new one born on 1759: Mary Wollstonecraft. Simonetta Vespucci. La nascita della Venere fiorentina. pp. 192, ill. col., br., libro + DVD, € 18,00; with a DVD about the fashion of that period. Simonetta. Una donna alla Corte dei Medici.